Homemade Strawberry Syrup is an easy recipe that takes about 15 minutes to make. 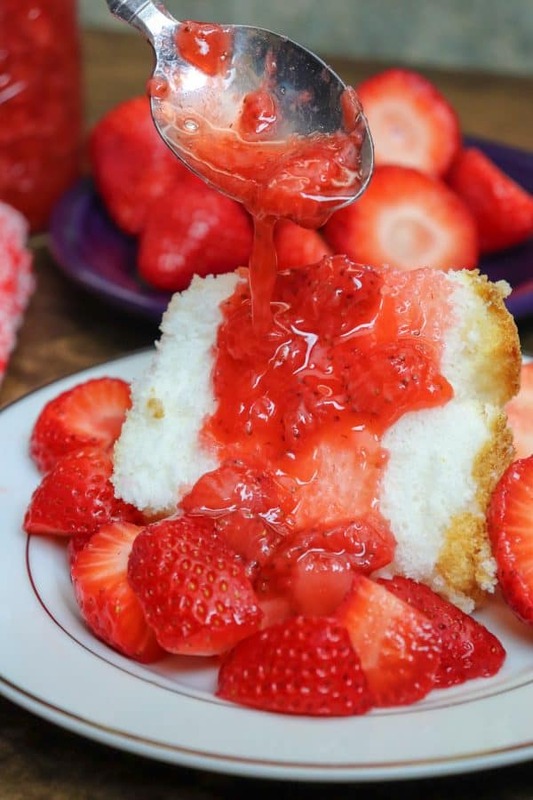 It’s perfect on shortcake, angel food cake, or ice cream. My sister loves strawberries. She’s loved them all of her life. I can recall hearing about my mom taking her to pick strawberries when she was a toddler. Our mom toted her through the field in a wagon and picked strawberries as they went along. And my sister ate the strawberries as fast as my mom picked them. 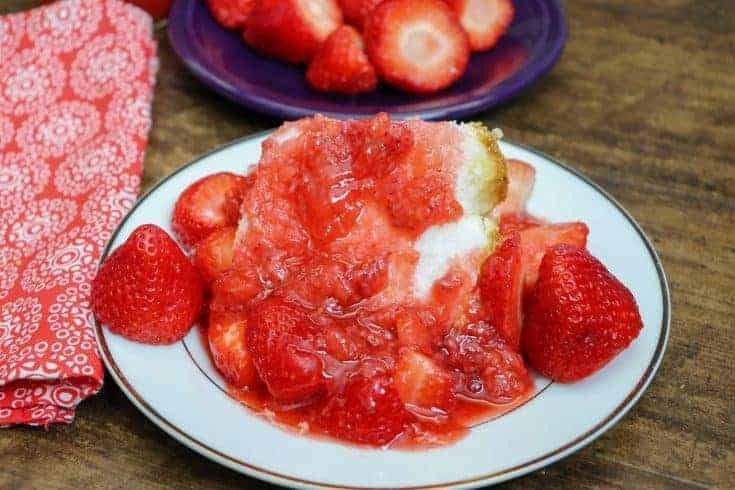 My mom and grandmother would make her strawberry shortcake on occasion and she loved it. This simple strawberry syrup recipe is so easy. 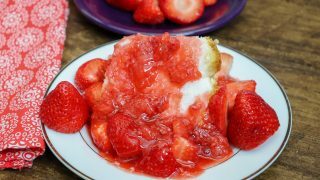 You can use it as a strawberry topping for cheesecake, on top of desserts, or you can spoon it right out of the jar. If you’re canning strawberry syrup it won’t take long at all. 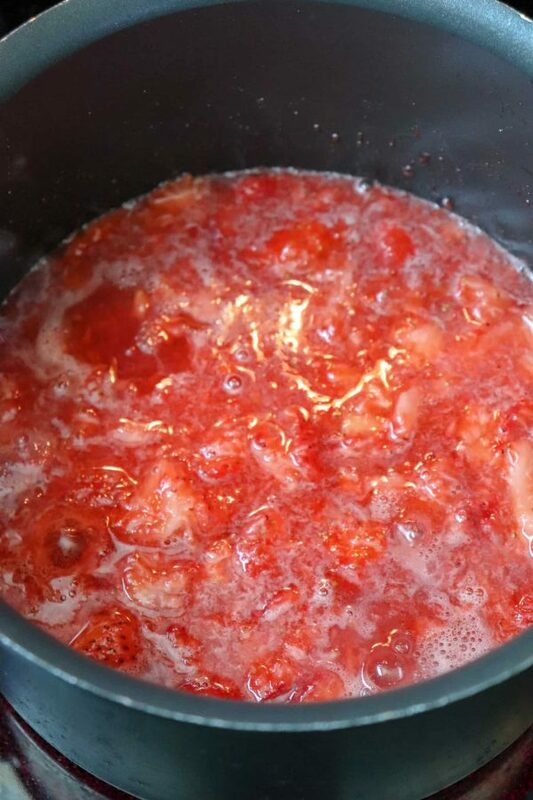 How do you make simple strawberry syrup? Add the strawberries to a saucepan. Pour the sugar and vanilla on top and mash the strawberries. Bring to a boil and then turn down to simmer for about 10 to 15 minutes. 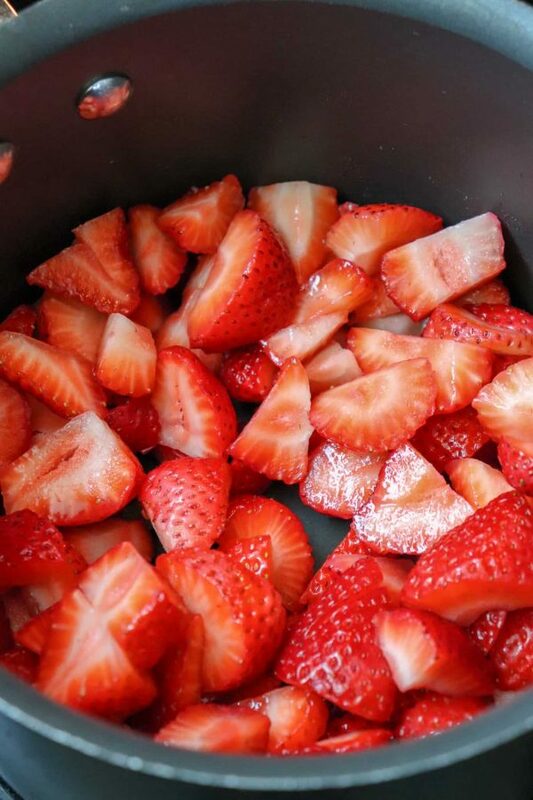 Add the washed and sliced strawberries to a saucepan. 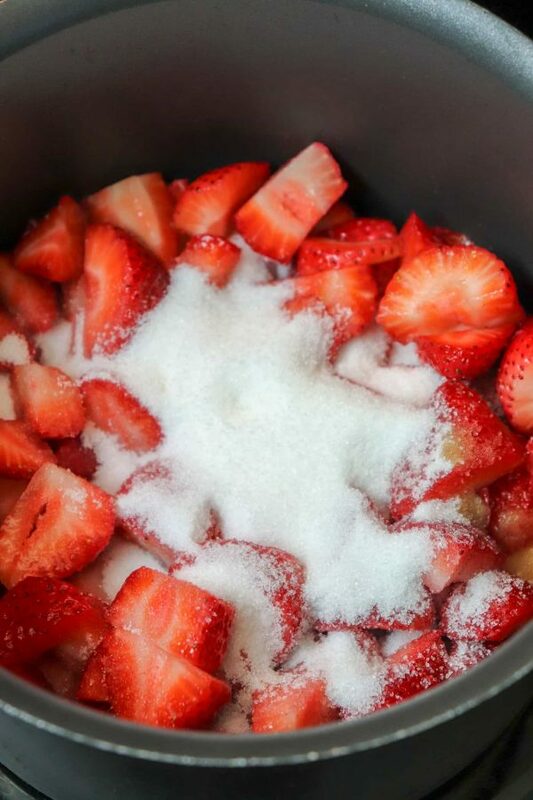 Pour the sugar and vanilla on top of the strawberries. 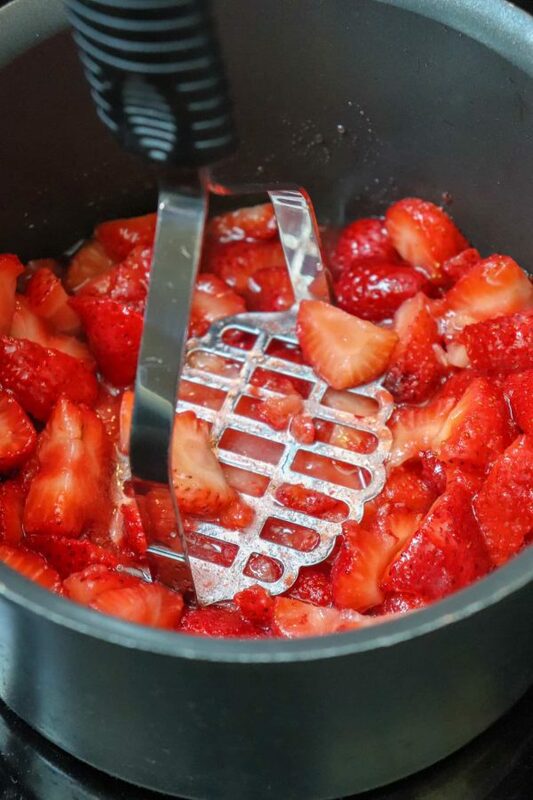 Once the strawberries start to heat up, take a masher and give them a good mashing. I used a potato masher. You can use an immersion blender, a fork, or anything that does the job. Let your strawberry syrup come to a boil. Then turn it down and let it simmer, uncovered, for about 10-15 minutes. Pour your syrup into a jar or on some cake, pancakes, or ice cream. You can keep the syrup in the fridge or freezer. It’s a cinch to make and a treat to eat! 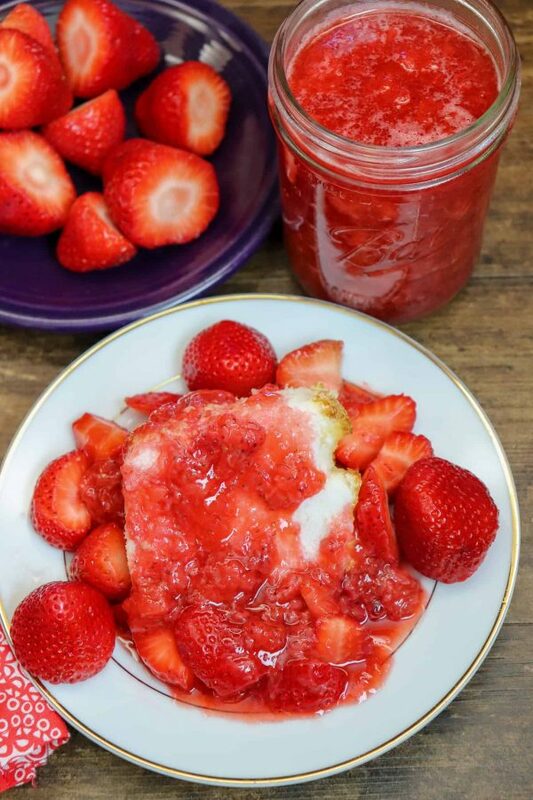 Homemade Strawberry Syrup is an easy recipe that takes about 15 minutes to make. It's perfect on shortcake, angel food cake, pancakes, or ice cream. Add the strawberries, sugar, and vanilla to a saucepan on medium to high-heat. Stir the ingredients together and mash the strawberries with a masher. Reduce heat to simmer and cook for about 10-15 minutes. Remove from heat and use, or store in a jar.